TotalCon begins this Thursday! If you haven’t pre-registered don’t worry. You can get your ticket on site. There are heaps of games, events, panels, and fun to be had. This year I will be in attendance with Troll in the Corner owner & Indie Talks host Ben Gerber. Ben, as a Guest of Honor, is running a few events and is also sitting on a slew of panels. Be sure to look at Ben’s Schedule to see what he is doing. If you are coming to TotalCon this year, I’d love to meet you. Below you can find my public con schedule. Just look for the tall guy wearing either a black or gray Wargaming Recon t-shirt. If you like us on Facebook you will be able to see a photo of me during the con to make it easier for you to find me. Guest of Honor Jay Libby is running this Mekton Zero game. Can’t wait to try it out before Mekton Zero hits stores. I’ll be dining in Pike’s Peak. If you see me don’t be shy, feel free to come up and say hi! TotalCon thanks its GMs with a GM Social. This is ONLY open to GMs. If you’re also a GM you can catch me hanging out there. When I return to my hotel room I am recording my thoughts on the day. With luck I may even be able to edit and release the recordings from the con, for your listening pleasure. A guy has to eat. The hotel serves a good breakfast buffet. This is a good way to meet other gamers and catch up. Guest of Honor Ben Gerber sits on this panel. You can find me in the audience taking copious notes for a future podcast episode. This is a perfect time to grab a bite before the big Raid on Pitt’s Landing game. I am GMing the Raid on Pitt’s Landing, with Adam, Adrian, and Cort. Using the Muskets & Tomahawks rules, players control 54mm models in this non-historical scenario set in the French & Indian War (1754-1763) shortly after the French capture Fort Duquesne (present day Pittsburg). A French & Inians force attacks the small British settlement of Pitt’s Landing with instructions to burn the settlement to the ground. They must also inflict as many casualties as possible. Come join in the fun. 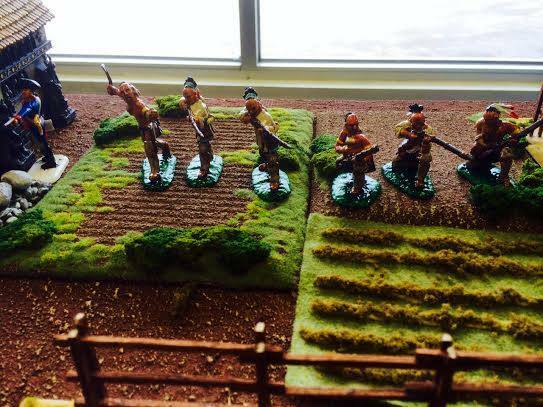 We provide all the models, terrain, and materials you need to play our recreation of this fictional battle from the French & Indian War. We’re using 54mm models in the style of classic toy soldiers and the Muskets & Tomahawks rules. Time for another meal and a chance to reflect on the Raid on Pitt’s Landing event. GM Mike Paine is running this Fistful of Lead naval game set on the Yangtze River in China. I will play in any game that Mike runs. Can’t wait to roll some dice with him. I can’t speak about this but please know it has the opportunity to open quite a few doors for Wargaming Recon.